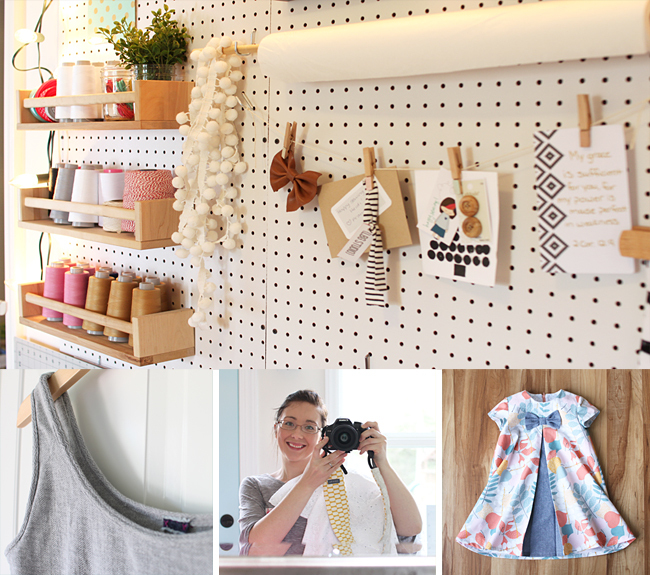 Tilly and the Buttons: Sewing Space Tours...Heidi's stylish hub! This week, we've been allowed a nosy around another beautiful and inspiring sewing space, as part of our series of Sewing Space Tours. 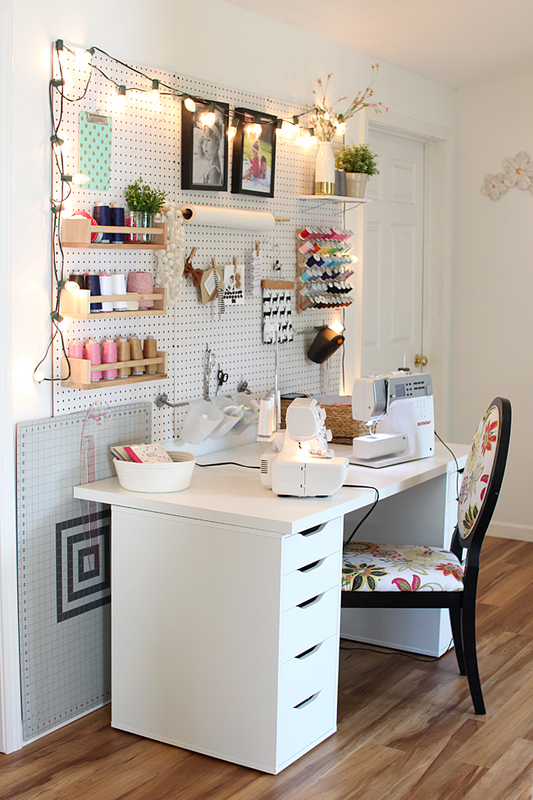 Come and have a look at Heidi's stylish and practical sewing area - it looks like she's as obsessed with Ikea units as we are! Read on, dear reader, to find out more! Hi everyone! I am beyond thrilled to be here, sharing my space with you all today! My name is Heidi, I blog at Handmade Frenzy. I live in the Charlotte area of North Carolina. I’m a stay-at-home-mom to my two boys and one girl, and wife to my very best friend. They are my life. Sewing is my sanity saver, haha! I love to sew clothes mainly, and I started out sewing for my oldest two children. However, soon after my youngest was born a year ago, I got totally hooked on sewing for myself. Now, the majority is for me, but I do have some very adorable things planned this summer for the little munchkins in my life, too. My sewing space is basically in the centre of the action. My youngest son’s room (which holds many of his toys) is just off to my right as I sew, and there is currently also an Expedit unit in the space that holds cars and Legos. Off to the left, there is a corner by the stairs that houses the play kitchen and baby book nook, so baby can “read” while I’m puttering around my space. The dining room is also off to the left, and the table serves as my cutting table when needed. The big kids have all of their craft supplies in that room, and they love to work on some little project at the same time as I am working creatively. I LOVE this. It allows the kids to play and be with me, and we can interact while I sew. It can be distracting at times (! ), but this is truly the only way I can get any sewing done. Of course the most productive times happen when baby is snoozing in his room! 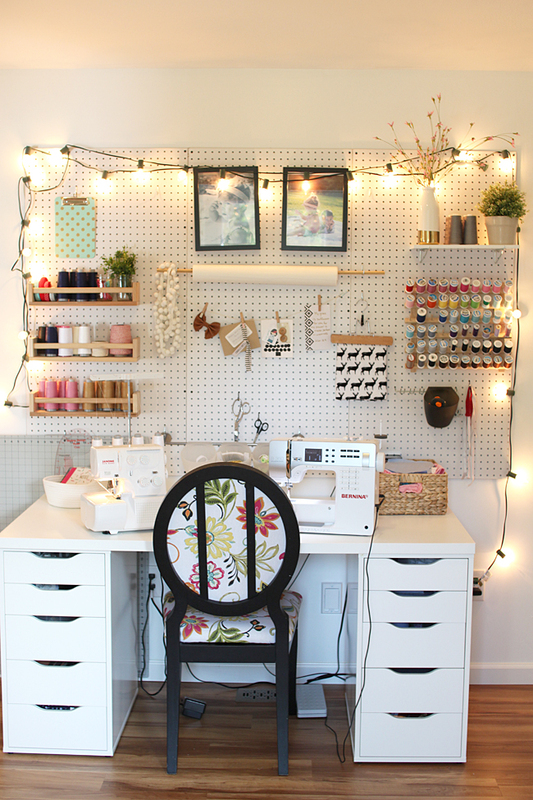 My sewing space has majorly evolved over the past 4ish years since I got really into sewing. It started out as an old Kenmore sewing machine and a little bitty desk that I thrifted during our first year of marriage. That little desk moved around and has been in literally nearly every room/corner in our house, with the exception of the kids’ bedrooms. After a remodel of the kitchen/dining/laundry area of our house, I am SO very lucky to finally have my own space dedicated to sewing! And a brand new sewing desk with room enough for two or more (I hope to add a Coverstitch next!) machines. A unique feature of my space is just that – it is more a “space” than a room. There are 5 doorways into the space and no windows, so decorating and organizing and making it functional took some creativity! Thankfully, there is one fairly large wall in the space that I could utilize, and utilize it I did. I hung a large peg board above my sewing desk and, as part of the décor, I hung a string of lights which added some much needed illumination without taking up desk space with a lamp. I am so in love with it! It brought both aesthetic appeal and functionality to the space that it lacked beforehand. 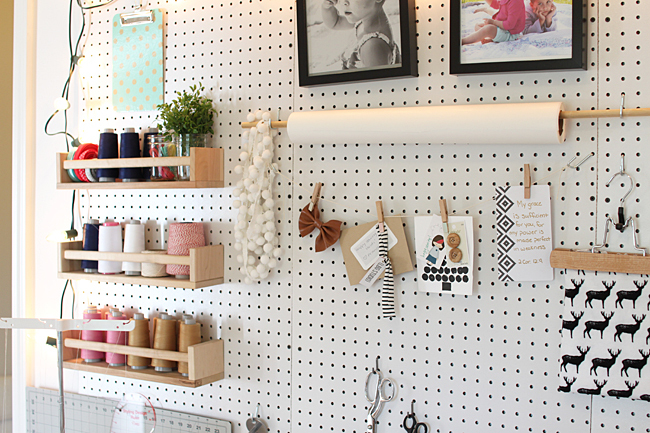 My inspiration board is my pegboard in a way. I love to hang little bits and bobs that I find inspiring and encouraging. Most of the furniture in my space is Ikea – I can’t help it. I’m an Ikea addict. 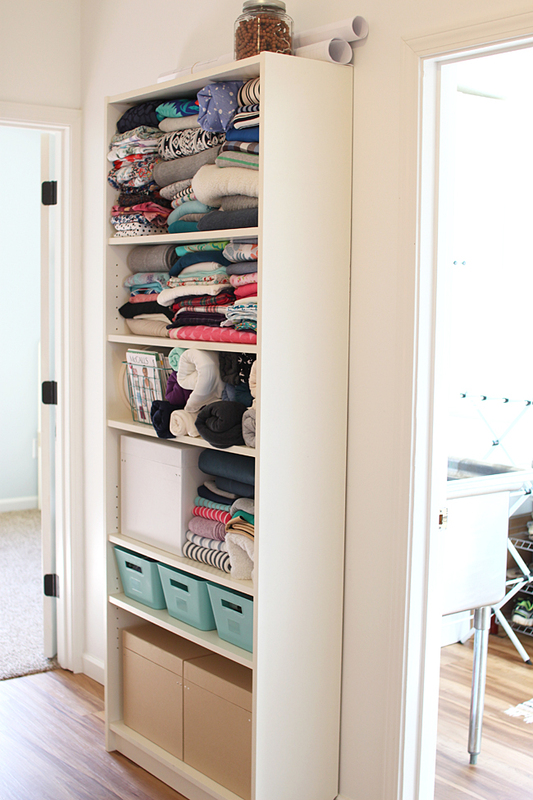 My husband once said that our house is starting to look like Ikea threw up in it – oops! 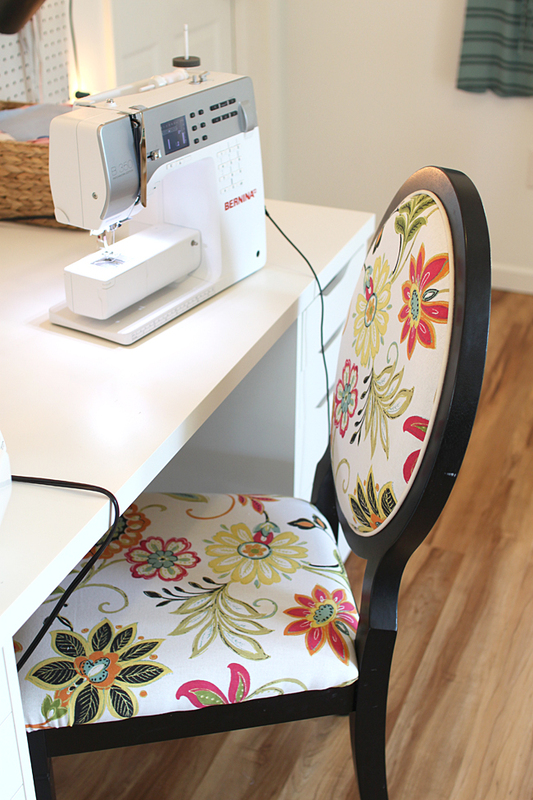 My sewing chair, however, I thrifted, and just last week I reupholstered it, from a solid cream (that had seen better days) to this magnificent floral print! I may have squealed a little after I put it back together and saw that it turned out just like I had imagined and hoped. My Billy Bookcase (from Ikea, of course) is the home for the main bulk of my fabric stash. It also houses all of my patterns: the PDFs are stored in the cardboard file boxes, and my small paper pattern stash lives in a wire basket along with my camera. The two drawer units on either side of the desk keep all the essential tools needed while sewing at my fingertips. In fact, they are rarely ever closed when I’m working on a project. Another little addition to the space recently is the little set of hooks on the wall to the right of the sewing desk. It is my favourite way to store patterns that I’m currently using, or that I use frequently. I gather all the pieces together and clip them with a curtain ring clip, then hang on the hook. I also like hanging progress garments or just-finished garments, as it’s fun to just admire for a while before hanging them away in the closet! So there you have it – my space! It still is going to have a bit of tweaking as time goes on, but for now, it really is my favourite spot to hang out in. I find that bright, happy, and well-organized spaces help me to be the most productive, and I feel like this space fits that bill. Thank you for sharing your space with us, Heidi! We LOVE how stylish and organised you've made it, and how you've managed to incorporate crafting time with you kids! Did you see Lisa's yurt, Katie's spare room, and Katryna's living area? Check them out! And find out how to submit your space to be featured on the series. We can't wait to see your spaces!